Polish rabbi; born at Vladimir, government of Volhynia, Russia, about 1580; died before 1646. He was the elder brother and teacher of David b. Samuel ha-Levi, author of the "Ṭure Zabab." As a young man he became rabbi of Chelm, Russian Poland; later he lived at Lemberg. He was the author of an important work in two parts; the first part, consisting of responsa, is entitled "She'elot u-Teshubot R. Yiẓḥaḳ ha-Lewi"; the second, consisting of novellæ, is entitled "Ḥiddushe Halakot." The work was published at Neuwied in 1736. Other responsa by him are found in his brother's "Ṭure Zahab" (ch. xxv., on Oraḥ Ḥayyim; ch. xxvii., on Yoreh De'ah), and in the "She'elot u-Teshubot Geone Batra'e" (No. 20). David b. Samuel ha-Levi's grandson Isaiah b. Abraham, in the preface to his "Be'er Heṭeb Yashan," said that Isaac had written a work entitled "Paḥad Yiẓḥaḳ," a commentary on the Yoreh De'ah, and another entitled "Ḳorban Yiẓḥaḳ." 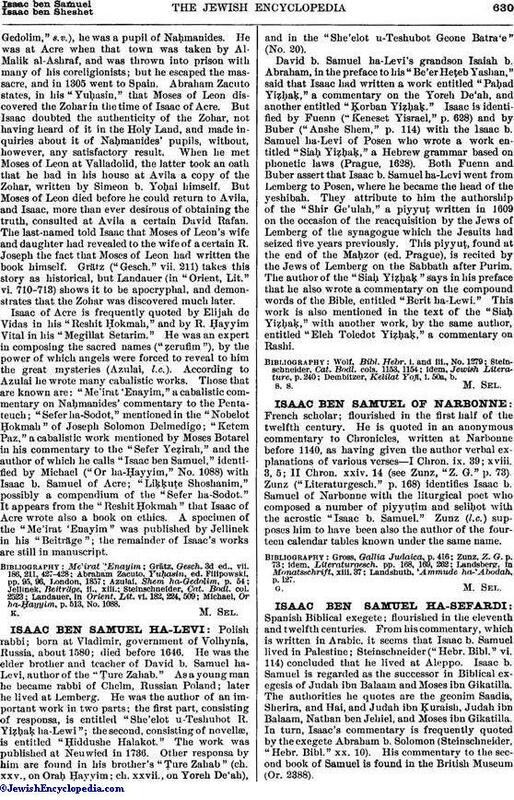 Isaac is identified by Fuenn ("Keneset Yisrael," p. 628) and by Buber ("Anshe Shem," p. 114) with the Isaac b. Samuel ha-Levi of Posen who wrote a work entitled "Siaḥ Yiẓḥaḳ," a Hebrew grammar based on phonetic laws (Prague, 1628). Both Fuenn and Buber assert that Isaac b. Samuel ha-Levi went from Lemberg to Posen, where he became the head of the yeshibah. They attribute to him the authorship of the "Shir Ge'ulah," a piyyuṭ written in 1609 on the occasion of the reacquisition by the Jews of Lemberg of the synagogue which the Jesuits had seized five years previously. This piyyuṭ, found at the end of the Maḥzor (ed. Prague), is recited by the Jews of Lemberg on the Sabbath after Purim. The author of the "Siaḥ Yiẓḥaḳ" says in his preface that he also wrote a commentary on the compound words of the Bible, entitled "Berit ha-Lewi." This work is also mentioned in the text of the "Siaḥ Yiẓḥaḳ," with another work, by the same author, entitled "Eleh Toledot Yiẓḥaḳ," a commentary on Rashi. Dembitzer, Kelilat Yofi, i. 50a, b.